Let’s face it… A lot of expectations and requirements rest upon the shoulders of a marketing team. And often, those expectations and requirements are ramped up without the necessary support to accommodate real growth. So how do you expand your reach and stay in control of the results for your B2B marketing services? Marketing technology has exploded. From 2008 to now, MarTech, the de facto benchmark of the expanding ecosystem grew to well over 4000 tools and counting. No wonder marketing teams are feeling a bit out of control. Executives hear about success elsewhere with this tool and that tool for marketing lead generation, and then jump on the bandwagon without considering what is required to implement and leverage the technology. So why are marketing teams struggling with results, and, worse yet, why are some teams not cognizant that there’s a problem? Let’s take a look at some of the most common pain points, missteps, and fallacies that we see in working with marketing departments. What drives a business to seek out new B2B marketing services? All of the pieces are there, but there is a need for help to put everything together in a smart, strategic and functional process. Lack of bandwidth to be able to focus on developing consistency in timing and message. Not everyone is on the same page as far as messaging and content strategy. There is a lack of content creation and strategy support. Often teams are unclear or uneducated on the amount of content needed to run a campaign. Budget restrictions also restrict the full utilization and realization of B2B marketing tools. The team is heavily relying on a single action point like email within the buyer continuum, which, in effect, creates an incomplete and ineffective process. What are the main complaints about the average marketing system? Lack of viable or quality content usually is due to the failure to recognize that the bandwidth and available resources cannot handle this need. Often these systems and the requirements to run them are just layered on top of existing marketing manager roles. Systems in place can be too centralized, causing bottlenecks in execution. Decentralized systems often lack the necessary adoption after an initial sprint to implement, ultimately underutilizing the tool. 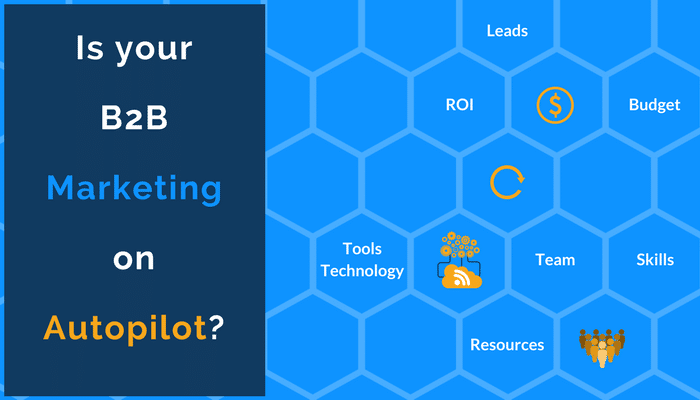 Want to talk B2B marketing services? Need a critical eye on your current system? The experts at ResponsePoint would be happy to help. Get in touch, and we’ll set up a no-cost, no-obligation phone call to talk about your marketing frustrations, and how we can help. What kind of experiences are marketing and sales managers having, if they have not realized the need for change? From a marketing management perspective, they see campaigns that are pressed for time. There isn’t enough time to put strategic thought into the big picture and determine how campaigns can leverage each other. This is especially true in division-driving product teams and when marketing teams are decentralized. A marketing manager is jumping from campaign to campaign and often has competing efforts for their time and concentration. They follow the path of least resistance and give attention to the squeaky wheel. To offload some of the responsibilities of campaign management and resources would allow them to drive nurturing vs. individual tactical campaigns. Do it right vs. getting it done. From a sales management perspective, they are seeking streamlined execution and ongoing efforts—not a stop and start approach like tactically focused campaigns. These people need tools and resources to augment the campaign rather than waiting for the client or prospect to react. Sales teams are interested in pipeline acceleration that helps them close more deals faster. The ah-ha moment comes from witnessing a marketing team’s unification of effort; seeing the insight or understanding of the goal, desired outcome and the involvement required. So, what kind of solution should they be seeking? The best way to move the needle on your current marketing lead generation campaigns is to find a partner to handle some of the execution and provide valuable, objective insights. The outcome would be better utilization of resources, lower costs, and stronger campaigns with a unified direction. This collaboration is particularly effective when the marketing services provider integrates more as a partner and less as a tactical execution resource. So, what’s the best way to revamp and ramp up your marketing efforts without drowning in the details? Finding a partner that’s well versed in all the intricacies of a successful process is vital. Having an objective, outside eye on your current system (or lack thereof) helps identify issues, and implement better practices. Leveraging B2B marketing tools like marketing automation or integrated campaigns like direct mail with telemarketing requires a partner who understands what’s needed to create and maintain a marketing process that evolves with the customer’s needs.